A toothbrush and toothpaste are among the many weapons for fighting against dental disease at home. I make sure my dog’s teeth get brushed regularly. OK, technically I delegate that job to my husband, who is much better at it than I am. And Healey (our Beagle-Spaniel mix) loves it. I’m not sure if it’s the attention he gets or the flavored toothpaste, but either way, he looks forward to the nightly ritual. When my husband is away, I don’t exactly relish the task. But I always do it. Why? I can’t imagine going a day without brushing my own teeth. That’s motivation enough for me. Plaque and tartar build up on cats’ and dogs’ teeth the same way they do on ours. In fact, dental disease is the most common disease in adult dogs and cats. By the time dogs and cats are 3 years old, most of them have dental disease. Fortunately, we can take our pets for regular dental exams and cleanings, and we can brush our pets’ teeth each day (just like we do to protect our own oral health). But like many people, my husband and I travel occasionally. And whether we take our dog to a kennel or he spends time with a family member, we wanted to find a way to continue combatting dental disease while we’re gone. Most kennels won’t attempt to brush a pet’s teeth, no matter how well-trained and used to the process a dog or cat is, and we don’t expect our parents — who haven’t had a pet in years — to attempt it either. So we looked into other products that could help. As it turns out, there are a bunch of great options you can use to help keep your pet’s mouth healthy between exams. You might find that a combination of these products works best for you. Or if you try one method and it isn’t successful, you may need to try something else. When in doubt, ask your vet which products she likes best. These are your main weapons against dental disease. 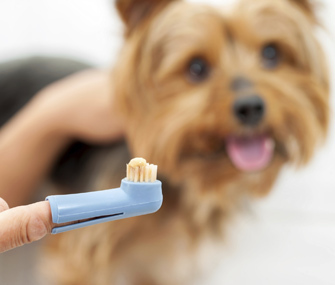 Choose a toothbrush that’s the right size for your pet. Toothbrushes come in a variety of sizes, so when in doubt, ask your vet to help you pick the best fit for your pet. Always use pet toothpaste — never human toothpaste, which isn’t meant to be swallowed and can make your pet sick. Choose one that contains chlorhexidine gluconate, which is a clinically proven antiseptic and antimicrobial, or enzymes like glucose oxidase or lactoperoxidase, which have antibacterial properties that decrease plaque.